Light-art-concert with projections of Lichtbende and organ music of Messiaen. A projection story about the seven-day creation. Ten old magic lanterns project the magical images on a 20 by 4 meters large canvas that take you to the origins of mankind. A surprising interplay with Messiaen´s organ music. Each part represents one day of the seven-day creation. Each day, different techniques are used to depict the story. The Japanese Utsushi-e and the Turkish Ebru technique, mechanically driven images in magic lanterns and manually manipulated slide projectors. 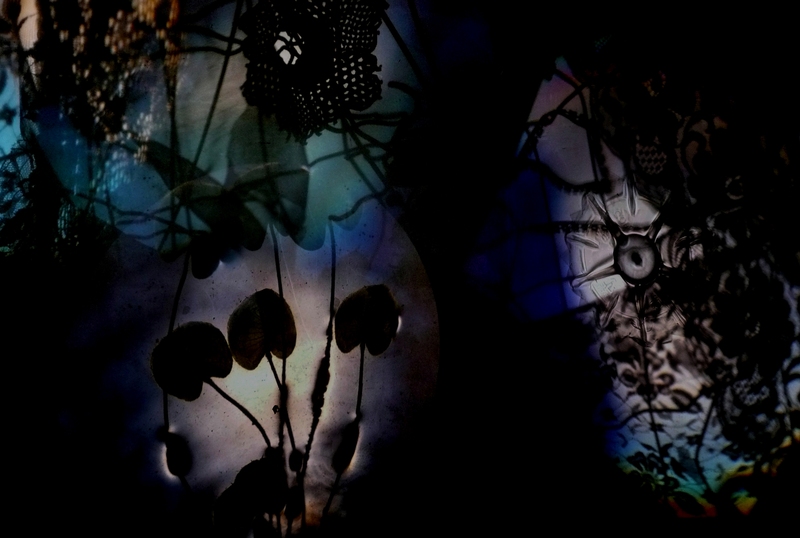 The projection images are created of everyday materials such as buttons, beads, caps and plastics and express a disarming lust for exploration. The audience can see how the performers make the projections with an impressive array of projectors and mechanisms. 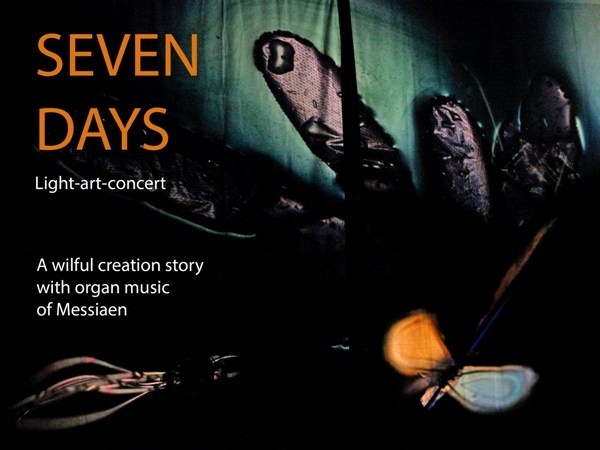 Seven Days was commissioned and performed for the Messiaen Festival in the ORGELPARK Amsterdam. 2015 February 28, 2016 Januari 29 and 30. Projections Lichtbende: Rob logister & Marie Raemakers. Dramaturgy and choreography: Jeannette van Steen. Gerrie Meijers is organist and pianist; She graduated with distinction from the Conservatory in Arnhem and won prizes at international competitions in Toulouse and Nijmegen. Gerrie Meijers gives concerts in the Netherlands and abroad. She specializes in accompanying vocalists and regularly participates in special opera, theater, dance and film projects. She played at the opening concert of the International Organ Festival Haarlem in 2012, the premiere of the Fukushima requiem Zsigmond Szathmary. Gerrie Meijers is organist of the Church Remonstrantse Haarlem and pianist / corepetitor in many choirs. Olivier Messiaen is without doubt one of the most religious composers of the 20th century. That fact makes his music instantly recognizable, especially since he has developed an idiom for it, based on self-constructed scales, a controlled way of rhythm disruption, the reference to birdsongs in his compositions and the use of new instruments. He was organist of the Parisian Ste-Trinité for decades.